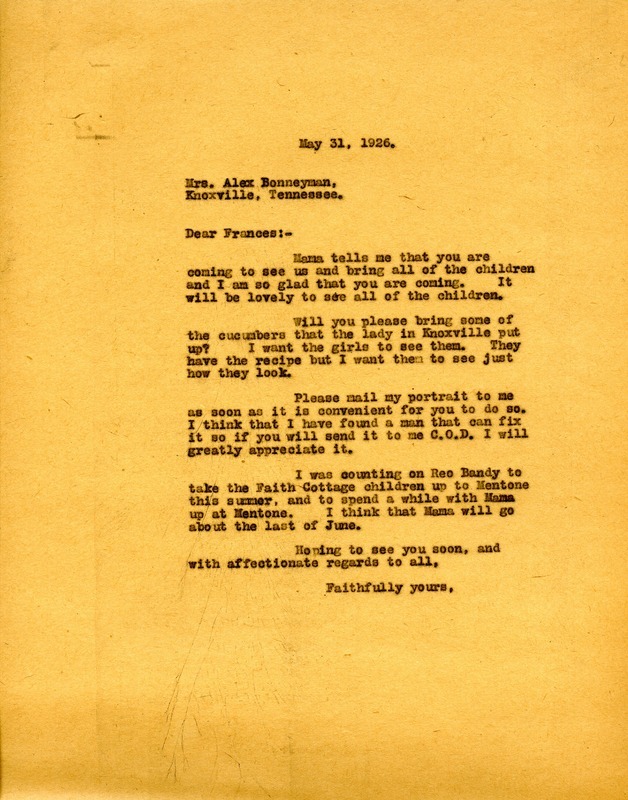 Martha Berry writes to tell her sister Frances Berry Bonnyman that she is glad that Bonnyman will be coming to visit and comments on how lovely it will be to see all of the children. Berry asks that Bonnyman bring cucumbers put up by a woman in Knoxville. She asks that Bonnyman mail her portrait to her, as she has found someone to repair it. Berry tells Bonnyman that she is counting on Reo Bandy to take the children from Faith Cottage to Mentone, and to also spend time there with their mother, who plans to go to Mentone at the end of June. Martha Berry, “Letter to Frances Berry Bonnyman from Martha Berry.” Martha Berry Digital Archive. Eds. Schlitz, Stephanie A., Sherre Harrington, et al. Mount Berry: Berry College, 2011. accessed April 25, 2019, https://mbda.berry.edu/items/show/1174.